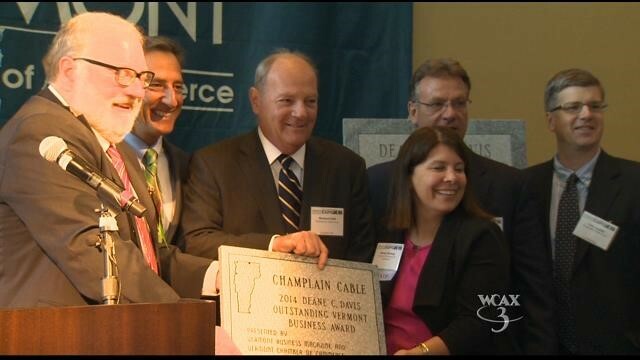 (Burlington, VT) Champlain Cable Corporation received the Deane C. Davis Outstanding Vermont Business of the Year Award on May 21, 2015. Each year, the Vermont Chamber of Commerce and Vermont Business Magazine present the award, named for a prominent former Vermont Governor, to a Vermont company that has met the highest standards of excellence over the past year. Nominated companies must show, among other things, continued growth, creation of a positive work environment for their employees and a commitment of their resources to improving their communities. Champlain Cable has experienced sustained and expansive growth over the last ten years, with revenues quadrupling, its workforce more than doubling and it’s reach expanding from a national to global presence. Committed to the well-being and value of its employees, the company provides some of the highest paid manufacturing jobs in the region, with benefits to match. Also committed to the well-being of its communities, Champlain Cable has its own charitable committee comprised of company employees that meets every quarter to evaluate and determine which community service organizations to support. That support not only includes donations of thousands of dollars to a host of organizations every year, but also significant volunteer participation by Champlain Cable employees. As the company celebrates its 60th year in business this year, Champlain Cable and all of its employees are especially proud and honored to have received this award.